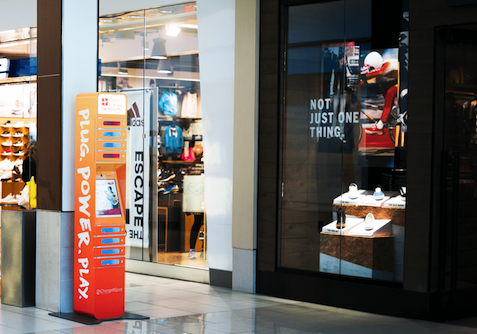 At ChargeItSpot, we’ve transformed a mundane in-store amenity – phone charging kiosks – into a powerful, attention-grabbing marketing platform for brands. We’ve previously described how you can use the ChargeItSpot user interface to promote your business, but an often overlooked customization is the kiosk wrap itself. Our charging kiosks can include custom wrap designs with graphics that stand out with eye-catching details or blend in with your existing decor. When Coach launched its limited edition PAC-MAN collection in 2016, they installed branded charging kiosks with wraps that incorporated graphics from the beloved retro arcade game. What made their charging stations stand out, however, was the creative use of the floor space surrounding the kiosk. Coach worked with ChargeItSpot to design removable PAC-MAN-themed vinyl stickers that peaked the mall shopper’s interest, leading them on an engaging path to the Coach store (and the charging kiosks). 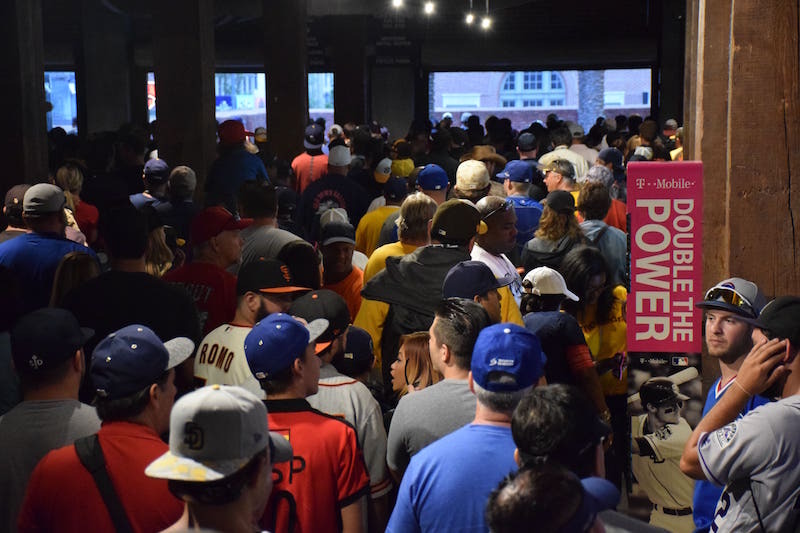 T-Mobile, a regular sponsor of Major League Baseball, teamed up with ChargeItSpot for a series of phone charging kiosks with their signature attention-grabbing magenta pink contrasted with black-and-white photography of well-known athletes. The photography adds a lifelike element to the kiosk wrap and invites sports fans to pose for pictures next to their favorite athletes. To celebrate the birthday of one of our favorite clients, ChargeItSpot designed a single Batman-themed kiosk for T-Mobile’s CEO John Legere, an avid fan of the Caped Crusader. 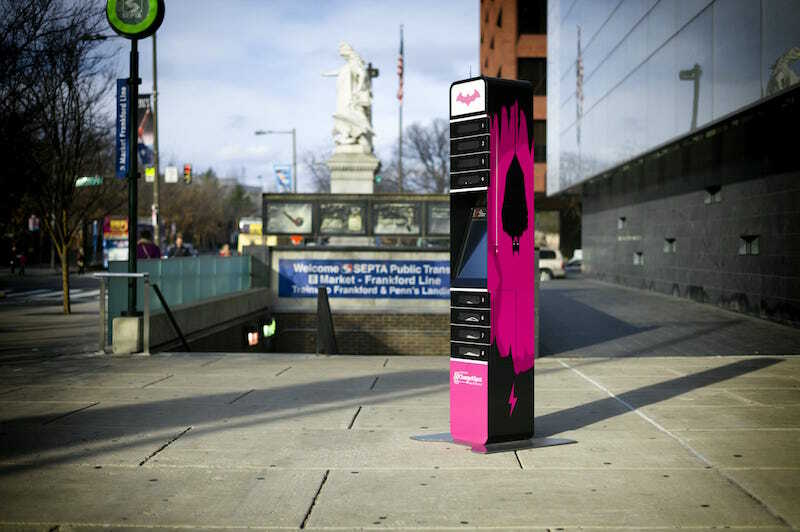 The charging kiosk features a variety of black Batman silhouettes against a magenta pink backdrop. The Batman kiosk is an excellent example of how you can use a phone charging station to showcase your personal hero or your company culture. Read more about our Batman kiosk here. Leave it to Victoria’s Secret to turn a phone charging station into a fun fashion accessory. Bold, playful and unabashedly pink, the kiosks at Victoria’s Secret flagship PINK store in Manhattan seamlessly blend in with the store’s signature “girly” aesthetic. 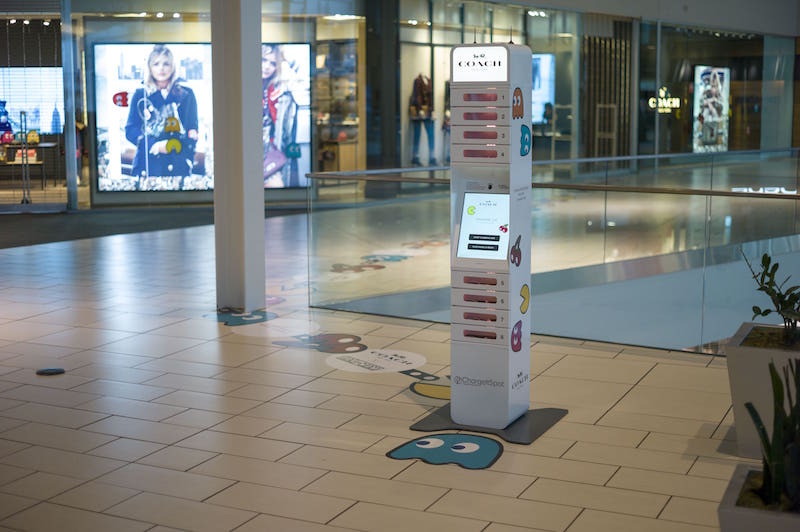 Direct Energy, a leading provider of energy services, sponsored a series of phone charging stations across malls in the US. Instead of going with a traditional, safe wrap design, Direct Energy chose an eye-popping and decidedly modern wrap. With its bright orange kiosks inviting shoppers to Plug, Power and Play, Direct Energy turned the boring utilities service provider image on its head. 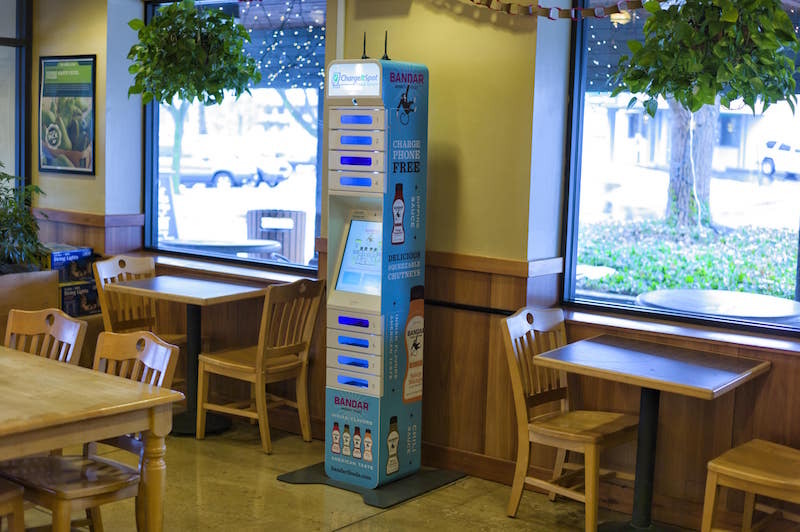 When it came time to launch their line of Indian cuisine-inspired condiments, food startup Bandar sponsored ChargeItSpot kiosks that were installed in Whole Foods grocery stores. They customized the kiosk UI with security images that showcased the different foods you could pair their condiments with and wrapped the kiosk with fun and creative images of their squeezable chutneys and their playful monkey logo. 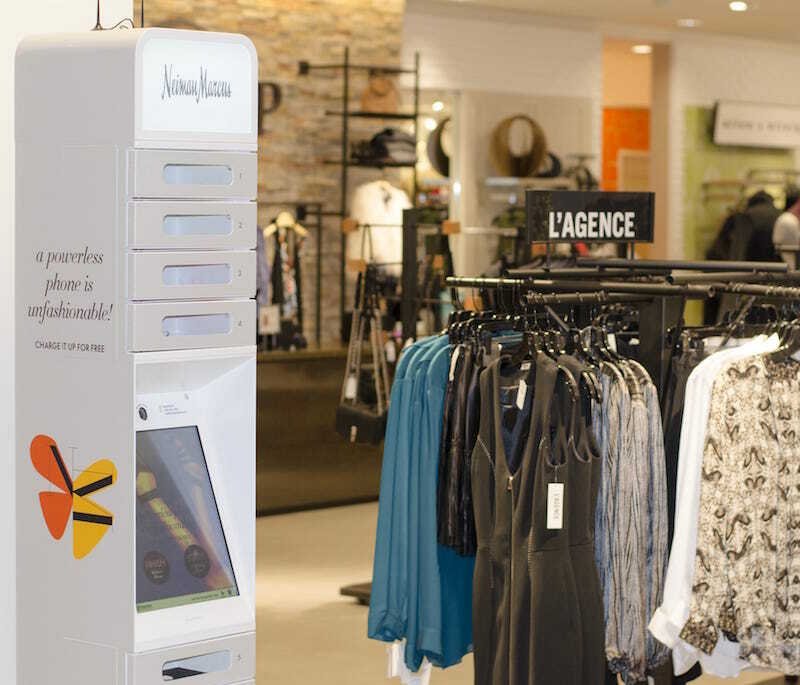 Luxury fashion retailer Neiman Marcus chose an elegant, all-white wrap design that incorporated a simple but totally on-brand message: “A powerless phone is unfashionable.” The statement relays the kiosk’s purpose in a way that is distinctive of the Neiman Marcus brand philosophy: fashion is everything, and everything is fashion.